Chicco has two ways you can have a travel system. The first way is to choose a Chicco Cortina travel system set, which we’ll go into more detail on this page. The other option is if you wish to purchase one of these other models that can accommodate the Chicco KeyFit or KeyFit 30 infant car seat. When deciding on a Chicco Cortina travel system, you must consider that one comes with a KeyFit car seat with a 22-pound weight limit or a KeyFit 30 infant car seat with a weight limit of 30 pounds. 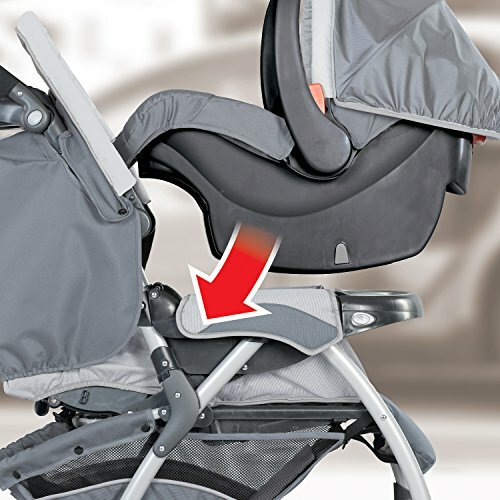 Both Chicco travel systems include the car seat base. 0.1 Which Chicco strollers hold a car seat? 8 Where can I buy the Chicco Cortina Travel System? Which Chicco strollers hold a car seat? With these three models, you have to purchase the car seat separately, but the Cortina stroller comes as a set. If you prefer one of the three models above, you should read about the KeyFit and KeyFit30 car seat reviews just below to help you choose which one to purchase with your Trevi, S3 All Terrain or Together Tandem. Before we get into the details of the car seat and stroller separately, please look at this informative video of the Chicco Cortina travel system as a set. Let’s take a look at the Chicco KeyFit car seats first. They are essentially the same car seat, except the Keyfit has the 22-pound weight limit and the actual car seat weighs a bit less than the KeyFit 30. Both KeyFit car seats have earned a Recommended mark from Consumer Reports and both are rated #1 in each class for crash protection, ease of use, and for both LATCH and seat belt fit. Overall the ratings for the Chicco KeyFit and KeyFit 30 have been 4 stars with safety and ease of use being the most popular reasons. Parents have written in with reviews saying that the KeyFit and KeyFit 30 are both easy to install correctly and the harness straps are easy to adjust to baby’s size. The infant seat inserts seamlessly yet securely into the Cortina stroller, which is important when your little one is sleeping during this transition. Because these Chicco travel systems have a special padded insert for the seat for newborns; babies as little as four pounds can ride safely and parents write how grateful they are for this feature during the ride home from the hospital with their precious little preemie. Because of this little extra touch, this is the best travel system for preemies. 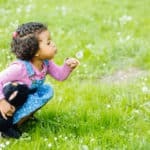 While reviewers do like the cushiony softness of the seat, many have remarked that this car seat makes their child too hot and that the fabric is not breathable. One reviewer, however, has said that many car seats are like this. The only other drawback mentioned periodically about these car seats are that they are a bit heavy to use as part of these Chicco travel systems. Take a look at this video demonstration of the KeyFit car seat while keeping in mind that the KeyFit 30 has the same features and benefits, it’s just slightly larger and can accommodate a baby up to 30 pounds or 30 inches in height. The Cortina stroller is one of the most popular models for Chicco travel systems. And it’s no wonder; parents have given the Cortina an overall high rating for this quality, mid-priced stroller. There are lots of other options to customize this stroller as well, such as the five-point safety harness and sun canopy. The adjustable leg rest is a wonderful feature for your baby in that it can flip up, and with the seat fully reclined, it makes a safe, cocoon-like enclosed bed for your newborn (your baby still strapped in, of course). The leg rest also extends out for support when your baby is still too little to reach the foot rest, and one your little one is big enough, the leg rest folds down, providing cushioned support behind the legs. The Chicco travel systems receive the most positive feedback about its ease of use in folding and the fact that it folds upward into a standing position, rather than down flat. Parents appreciate the maneuverability and the smooth ride that the suspension system provides. Another positive comment commonly received about the Chicco Cortina travel system is about the adjustable handle. Couples who are tall, or where the husband is tall and needs a different handle angle, give glowing comments on how comfortable this stroller is to push without kicking the back while walking or without stooping over. The handle also folds completely down when you fold the stroller, providing about six additional inches of space. The sun canopy has had some disapproving remarks made about it. While it is adjustable, waterproof, removable and includes a peek-a-boo window, it could be larger for better shading when the sun is at various angles. Other parents have written in saying that the storage basket beneath the seat is impossible to access once the seat is reclined fully. A few reviews have stated that the Chicco Cortina travel system is heavy for its size. However, many other reviewers believe this is a lightweight stroller (it weighs 25 pounds). The bulk of the stroller, once folded, may take up more than half the trunk of a mid-sided car, which can be a drawback when you need more trunk space. Lastly, some Chicco travel systems owners are displeased with the wheels; they are plastic and become worn too easily, and some parents say it makes the ride more bumpy. 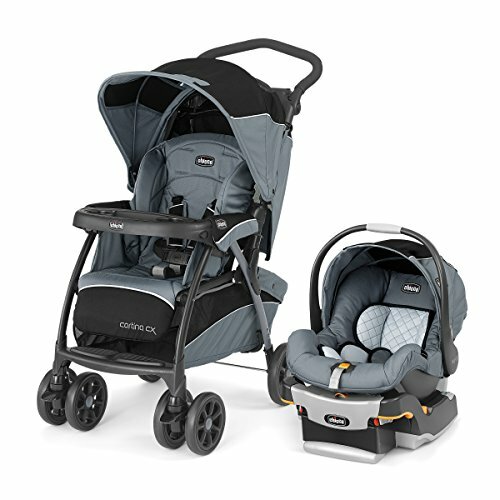 Where can I buy the Chicco Cortina Travel System? At the time of this review, Amazon beat other online retailers by 7-24%, depending on the color scheme you want. However, sites like MyStrollers have a better color selection for a competitive price. Imagine how easy it will be to get out with your new little baby and have a great time because you don’t have to worry about a thing!